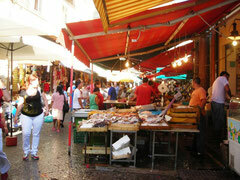 This 1,000-year-old market is located in the Albergheria district. Seasonal fruits and vegetables, plus tons of other fare, pack the tables as they have for centuries, creating a tradition and experience that shouldn't be missed. The way that Coppola’s mafia gangsters can knock up fresh spaghetti and meatballs to feed twenty men with the same ease that they knock around shop keepers is always surprising. But it shouldn’t be, for if Jamie Oliver has taught us anything it’s that food and cooking are central to the Sicilian way of life, where your metal in the kitchen is not just a hobby, but a question of pride. 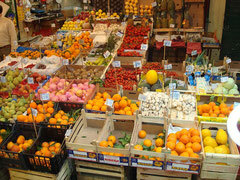 And only the best fresh ingredients will do, which could be the slogan for the Ballarò market in Palermo, a place overflowing with beautiful fresh fish, vegetables and cheeses. Originating from the era when Sicily was occupied by the moors, the 1000 year old market has run in much the same manner for centuries. It has strong Arab influences, resembling an eastern souq, and these influences are also evident in the merchandise itself. Next to mounds of ricotta and caciocavallo cheeses, barrels of olives and fat slabs of swordfish sit saffron and other spices and sacks of chick peas. The sight of the blood oranges, pomegranates, long stemmed artichokes and cuttlefish is an ocular feast, but the real way to experience the food is by tasting what the ready prepared food stalls have to offer. There are fresh salads, ripe tomatoes, fillets of fried fish and grills spread with squid and octopus so fresh that all they need are a squeeze of lemon. The friggitorie (fry shops) cook deep fried aubergine and other vegetables as well as panelle (chick pea fritters) and arancine (fried rice balls filled with mince and cheese); a feast fit for a don.